Today I have a special treat for you: another home tour! This tour is from Talya of Grace, Grits, & Gardening. Talya and I are both members of the Arkansas Women Bloggers. Talya shares stories of food, farm, family and fun on her blog. She tries to do something creative every day and believes any dish can be enhanced with a side of collards. I think you’ll really enjoy this glimpse into her home and life. I’m no specialist at decorating or organizing, but I like to play around with both and believe they go hand in hand. 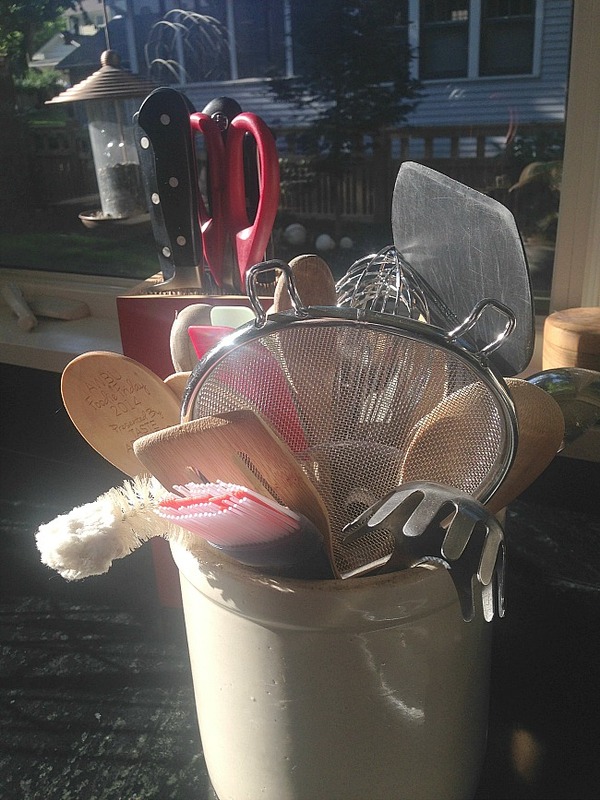 One thing’s for sure—clutter gives me the heebie-jeebies. I’m not obsessive (at least I don’t think so), but I lean toward the sparse side of decor. Less stuff equals less things to dust around. Even for those of us who don’t have to think twice about closet cleaning, too much stuff has a way of piling up in our lives. I came face to face with that lesson about ten months ago when I moved from Dallas to Fayetteville. After thirty plus years in Texas, moving was hard work. I’m settled now and excited to show off a few of my favorite spaces and ways I incorporate organizing into my decorating. 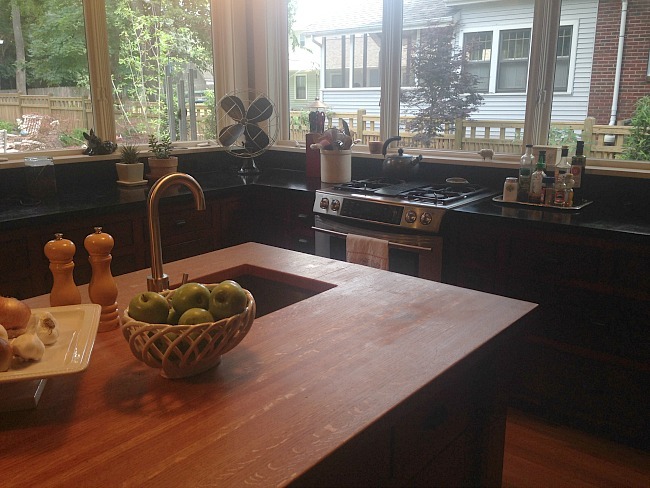 Our kitchen is one of my favorite rooms mainly because of the soapstone countertops (love them!) and huge windows that let in tons of sunshine. We have very few upper cabinets, and the ones we do have were constructed with glass fronts. I prefer glass-front cabinets and recommend them for keeping an orderly kitchen and for showing off favorite kitchen ware. With glass front cabinets, who’s gonna hoard fast-food plastic cups? Not me. 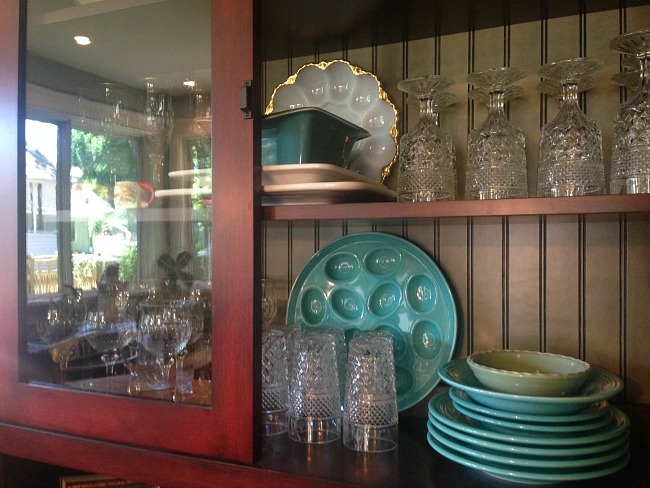 My favorite turquoise Fiesta dishes make for instant kitchen art. Bonus! I like to store oversized utensils in an old pottery crock within reach of the stove. This frees up valuable drawer space. Also, arranging cooking oils and go-to spices on a tray (visible in first picture) leaves shelf space for other items. Matching baskets, which once held a zillion video games and movies in the kids’ playroom, now house birdseed, plastic bags, oddly shaped light bulb boxes and paper goods in the pantry. 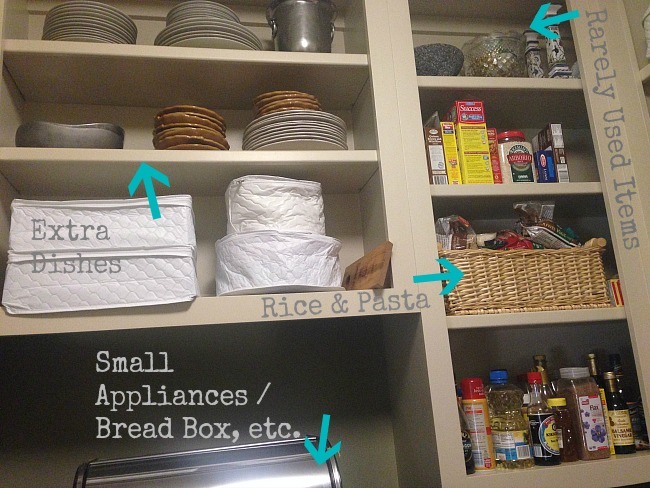 I’ll just say it right here—having an empty nest is an excellent organizing tip—ha! Extra dishes (no we aren’t caterers but maybe should be) are stacked overhead in inexpensive quilted china storage bags. Rarely used items are stored high. 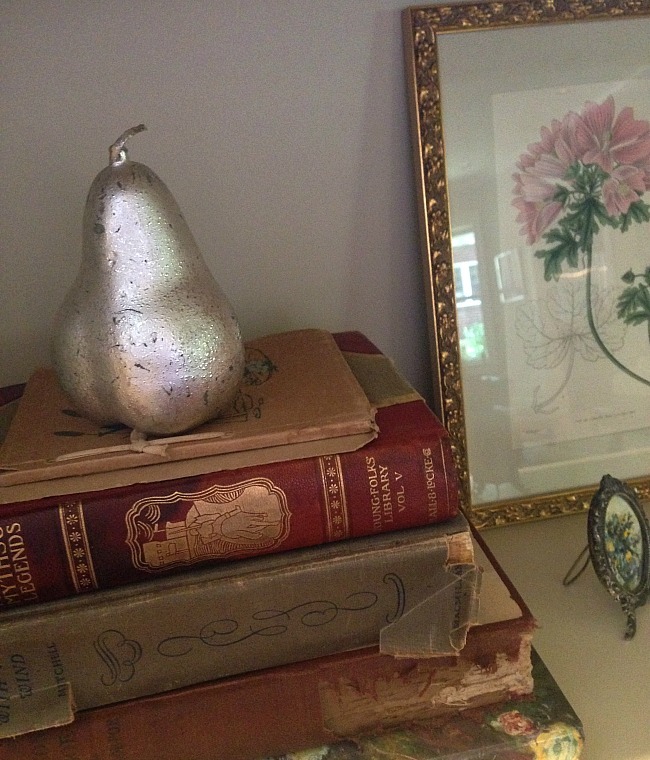 Even though I don’t like clutter, I still like to collect certain things—books, glassware, pottery and, ahem, dishes. 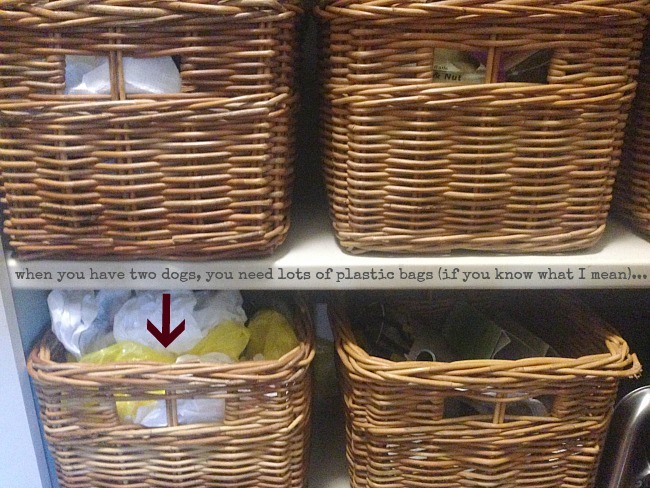 Grouping collections is one way to tame what could easily become a disorganized mess. Using collections for storage equals double points. Not that we’re keeping score, but kind of we are. In my mind, decorating with books justifies buying more. See how that works? 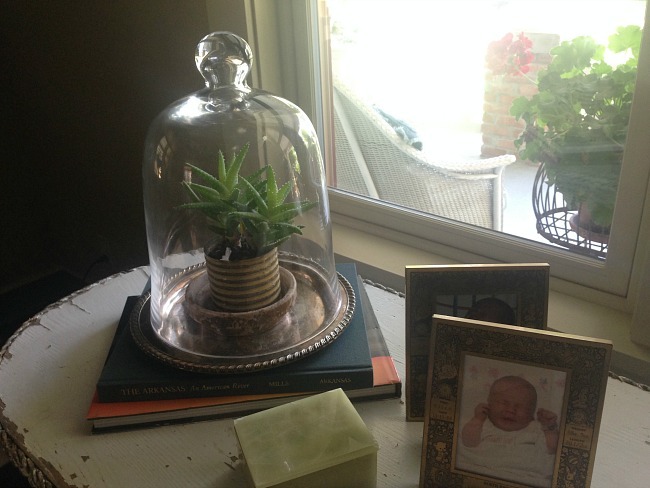 Old books provide an interesting plant stand for small specimens. Coffee table books are just cool in my opinion. And useful. 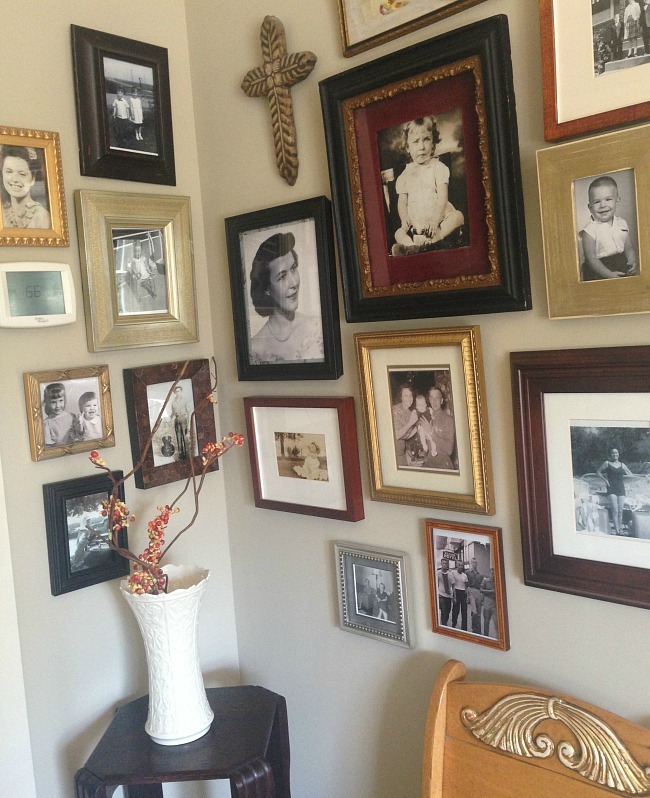 Grouping old black and white family photos in an otherwise boring corner is a unique way to add interest and declutter that photo drawer. Frames don’t have to match but should be complementary in style and color. Mix in a piece of artwork or wall hanging to add a little something extra. Think outside the bathroom and break with traditional. 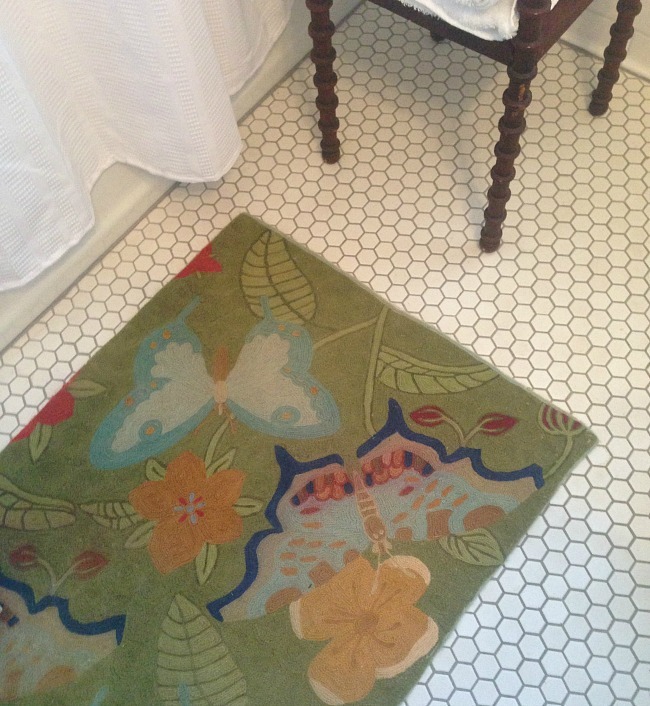 Use a vintage throw rug in your guest bathroom instead of a typical bath mat. Use a quirky bowl instead of a soap dish. I like to think these unexpected touches add personality. My favorite tip for maintaining a “relatively” clean house, is something I try to do each night before bedtime. I wipe down kitchen countertops, sweep the kitchen floor, stack dirty dishes in the dishwasher and get my coffee pot ready. These simple things, which only take a few minutes, make for a clean, peaceful start to the next morning. I’m all about easy, peaceful living. And now I leave you with one last picture. Pinch me, we have a library! The space is perfect not only for organizing my books (according to genre) and displaying family mementos, but it’s also one of my favorite places to write. Thank you so much, Talya, for sharing your home with us. 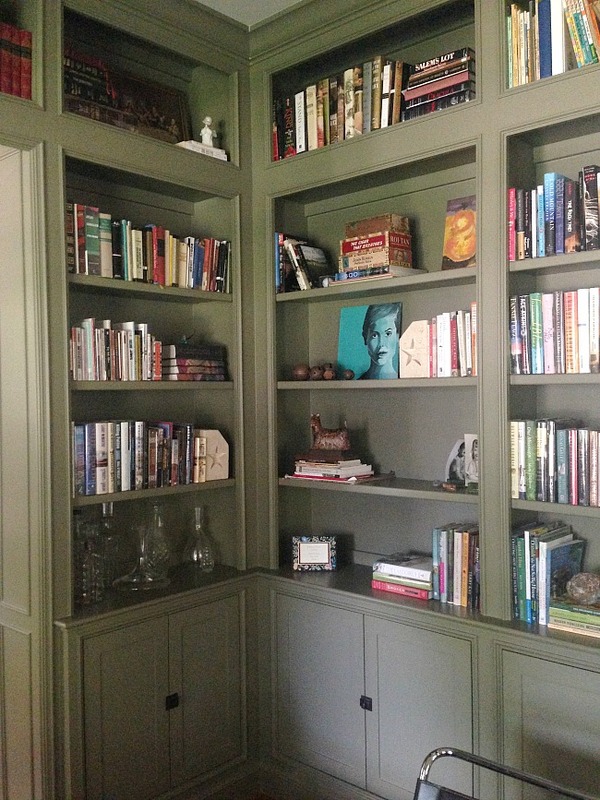 Your home has such eclectic personality – I love all the touches you’ve added to make it unique and personal to you. And your organizing style is so functional, which is just perfect. Go say hello to Talya on her Facebook page! Thanks for having me Mary! Talya, you have done a great job and your home is beautiful. Thank you Shelly! Nice to hear from you. You have fantastic taste, Talya. I love how you’ve arranged everything. Waving out to Mary. You have a lovely blog! Yes, Corinne, Mary’s blog is lovely. She is so incredibly organized. And with 4 kids! Love your house- thanks for the tour!!!!! Love your house and how wonderful you have decorated it. You have such good taste. Love the kitchen! I’d cook every day for sure! Me too! That kitchen is awesome! Talya, I love dishes, books, and baskets. Great tour. Thanks!